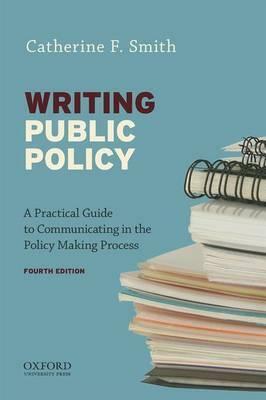 Writing Public Policy is a practical, concise guide to writing and communicating in public policy processes. Designed to help students understand and perform common types of communication used in solving public problems, this text explains the standards and functions of communicating in the public sector and teaches the use of selected public policy communication genres. Catherine F. Smith presents a general method for planning, producing, and assessing communications in a variety of real-life contexts and situations of public policy work. This book presents a general method for planning, producing, and assessing communications in varied real-life contexts and situations of public policy work. It explains the standards and functions of communication in policy making. It teaches the use of selected public policy communication genres and illustrates their practical use. It teaches critical thinking and language awareness. It includes numerous writing samples. It prepares students for careers in politics, government, law, public administration, public relations, nonprofit organization advocacy, journalism, public health, or any profession engaged in public process or concerned with public affairs. It is a lively, useful manual of practice for real-world communicators.